Whether you are a athlete or just trying to loose weight, the key is never to skip your Breakfast. This is the most important meal of the day and could probably be the biggest meal. The foundation of a good healthy lifestyle is to have a heavy healthy breakfast and then end it with a light dinner. Athletes need to eat regularly and have foods which are a bit heavier in calories. But they should contain good quality calories, that is healthy fats. We have extensively used Oats for Breakfast as they are healthy complex carbs with lots of fiber which keeps you full. The easiest recipe is Oatmeal with Oranges and Almond Milk which can be made in minutes. For those who want to be even healthier there is Buckwheat used instead of Oats in Buckwheat and Green Apple Porridge. Then there is Steel Cut Oats which is the healthiest of oats as its a gluten free whole grain. For Vegans, we have Apple Steel Cut Oats with Almond milk. Its best to make your steel cut oats in a big batch and save it for a week so your breakfast is then easier and faster to plan. Nothing like having Bread with Avocado for breakfast. We are talking of making your own Almond Bread at home and its super easy and healthy as its loaded with proteins and good fat. We have a large collection of healthy drinks. Each recipe choosen is devoid of sugar and cornflour. There are the best choice of fresh vegetables and fruits used. Our favorite is Red Capsicum, Carrot and Apple Juice and Carrot Tomato Beetroot Juice amongst juices. For smoothies try the Papaya Pear and Yoghurt Smoothie and Peach Yoghurt Smoothie. 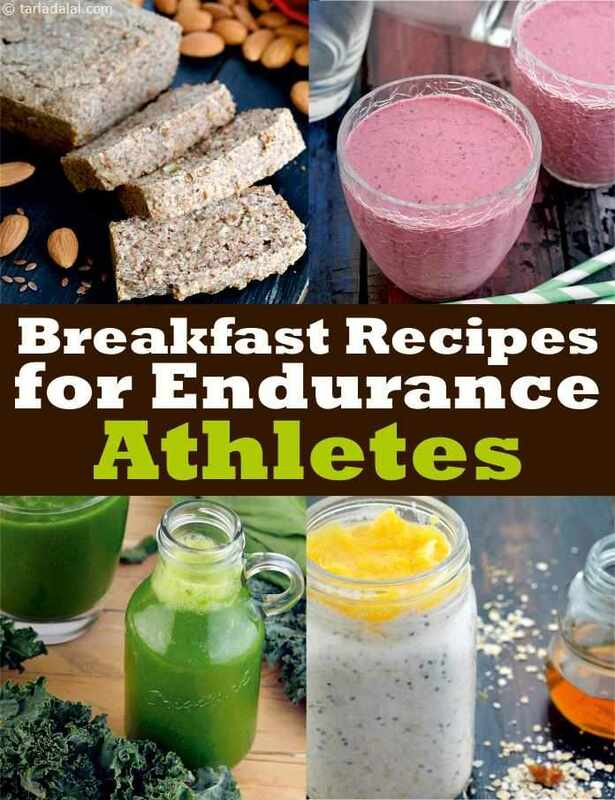 We hope you enjoy our collection of breakast recipes for endurance athletes. Other related articles for Endurance Athletes.